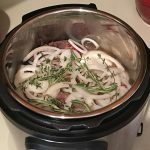 I recently purchased an Instant Pot pressure cooker and have been experimenting with recipes. This pressure cooker pot roast is hands down the best chuck roast I’ve ever cooked AND probably ever eaten. 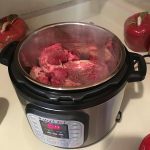 I usually cook a pot roast in my slow cooker for 8 or more hours to get that fall apart goodness…but that won’t be happening any more! You might be wondering why I decided to get an electric pressure cooker when I have a pressure canner/cooker for my stove top. It is a fair question. Frankly my pressure canner is huge and takes a long time to heat up for canning. Not to mention a stove-top pressure cooker needs to be watched fairly closely; while an Instant Pot is a set it and go device. Yes there are less expensive electric pressure cookers on the market too – but I wanted the Instant Pot’s stainless steel cooking pot. Ok enough jibber about the pots – let’s get to the grub! This roast was so good I couldn’t wait to share the recipe with you, even to get better pictures! So please excuse my cell phone shots here. 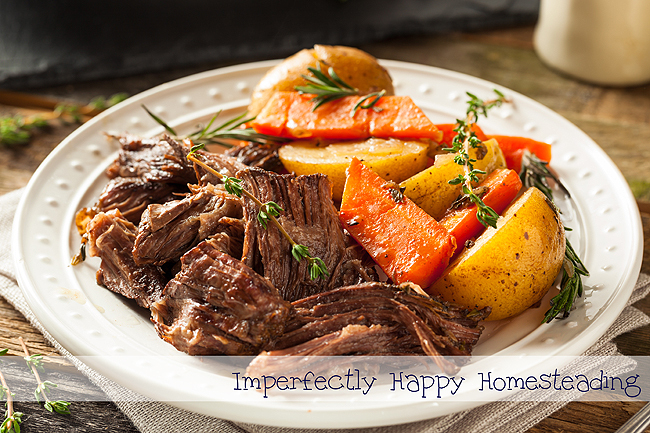 Trust me, the pictures do not do this pressure cooker pot roast justice! You’ll notice all the flavors are infused into the meat, carrots and the au jus juice (which I spooned over the tators and the meat). We got an instant pot for Christmas and haven’t used it yet. Work is cancelled for the next couple days due to cold weather in northern Illinois, so I want to try it out. We don’t have any children, and our parents don’t live on the property, so it’s only my wife and I. If I were to half this recipe, how does that affect the cooking time? No, you shouldn’t have to reduce it that much. Maybe take 10 minutes off. The BIG thing is letting it naturally release so it falls apart. Enjoy!